For Havas Voyages—voted the best travel brand in term of quality of service in 2018—customer experience is paramount. Within a market that is undergoing rapid transformation, and that tends towards disintermediation, the group is leaving nothing up to chance. What lies at the root of their success? Well, they offer a premium, customised and unique customer experience, in which the relationship between each customer and their travel planner is central. With this in mind, Havas Voyages has partnered with Critizr to help develop a customer relationship strategy that fuses digital with local. The travel planners from their 177 agencies respond to customer feedback actively, in a rapid and highly personalized manner (within 30 hours on average). In interactions with clients, these travel planners are often mentioned by name, and communication with them is very open and friendly. 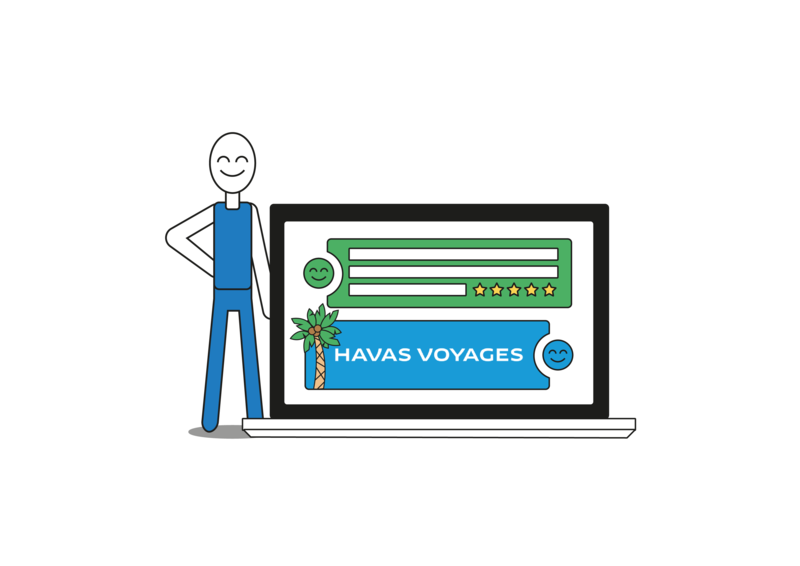 By requesting feedback from clients after they join their network of agencies, often through post-visit emails with a very high response rate (33% on average), Havas Voyages ensures it is listening attentively to its broad customer base. At this point in their customer experience, the clients have typically not yet finalized their purchases: thanks to this input, they provide rich insights to Havas Voyages and its travel planners. Even if the feedback is overall very positive, Havas Voyages also handles customer dissatisfaction via Critizr. A high level of care is given to clients who have indicated disappointment or doubt: they receive direct calls from travel planners who strive to resolve any problems that may have arisen. These interactions strengthen the close relationships forged by the brand. « As a travel agency, we offer a very emotionally and financially engaging service. We know that customer experience is absolutely essential. Because of this, we depend very much upon the relationship between the client and the travel planner. Critizr’s solution helps us strengthen this relationship by unifying digital and local aspects of our business. Through this platform, our travel planners have highly customised interactions with their customers. Our collaboration with Critizr seems completely natural! » Coline Ponsar, CRM Manager. Thanks to a partnership between Pages Jaunes (Yellow Pages) and Critizr, all locally collected feedback can be displayed on each agency’s Pages Jaunes profile.